There is something about the name Patsy that is irresistibly showbiz - or maybe I just remember Ab Fab too well(!). "Stick with us, doll, and you'll be all right..."
She has made a good transition from box rest to being firstly out on the track and now turned out in the fields during the day as well. Following the photos I posted yesterday of the TB with long, crumbly toes, I thought it would be interesting to plot how the state of his feet, and particularly the long toes, were affecting how his limb loaded. The 2 photos were taken only minutes apart, and all I have done is take the shoes off and lightly trim the weak, chipped hoof wall. This horse has a weak caudal hoof and, in shoes, you can see why. The vertical red line in both photos goes from the weight-bearing point at the back of the hoof. 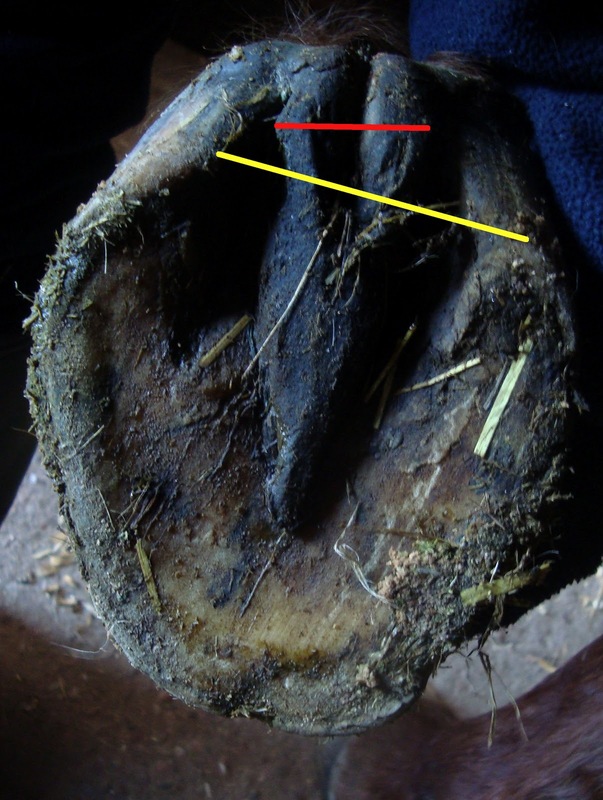 This point shifts considerably once the shoes are off and you can see how the long toe and underrun heel in the top photo had made it extremely difficult for the horse to engage the caudal hoof. He walked out on the roads fine and hardly tried to go on the verge at all :D"
Its always nice when new horses find a special friend, and Patsy found Ginger straight away. He is such a kind soul, and a perfect gentleman and I just had a feeling that they would get on. Often, I put new horses with Felix on day one, but Felix was hunting on Monday and actually I don't think any other horse would have suited Patsy quite so well! I would be very interested to know whether she has had other big chestnut friends or relations in the past, because you would think, looking at them, that they had been together for years. Ginger, meanwhile, had a difficult time during the bad weather we had - he hates the rain, just like the rest of us, and it was so relentless that it made him quite stiff and uncomfortable, which was a real shame as he had been doing well. The arrival of sunshine, and then Patsy, have both had a beneficial effect on him, though, and I think he is now getting back on track. His hooves, as you can see from the photo, are changing very encouragingly. 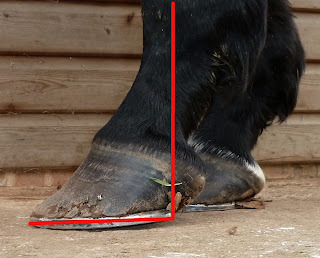 Following Wiola's idea, I have drawn a line (which you can see above) showing roughly where his hoof wall will be once it has fully grown in at the new angle. I've also added these, and it was only when I put the lines on them that I realised how interesting they really are - thank you again Wiola :-) The top photo is Ginger's LF when he arrived, the lower one is today. On both photos I have connected the widest point of the frog with a red line and the heel buttress with a yellow line. 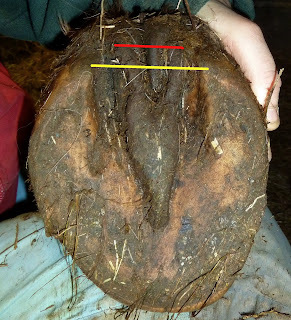 What a shift in hoof orientation! Even though he has a long way to go, its a good start. Double post today - too much to put up, too little time!! Following Isha's holey foot photos from last week, I thought I had better try and get some footage of her in action on a circle but rain keeps stopping play - till I managed to grab some between the showers yesterday. Although, since the start of Project Dexter, I've always filmed horses in a straight line when they arrive here, I haven't usually filmed them on the lunge initially. However, Bailey, Solomon and Kingsley have all made it clear that I need to start doing this as well, because its a very valuable record to have. Untitled from Nic Barker on Vimeo. Isha had been on a long period of box-rest before she came here and she is still weak behind which makes her inclined to rush. She is also worse on the right rein as it puts more pressure on the damaged hoof. I wouldn't work her for long like this, but to lunge her for a few minutes periodically does no harm and as an assessment tool its very useful. Solomon hunting from Nic Barker on Vimeo. No sooner has Solomon packed his satchel and headed for home than we have a new arrival - actually she arrived on Sunday and, having viewed all the rushing around on Monday morning with equanimity, seems to have settled in extremely well. Patsy is a very pretty mare who has come all the way from Sunderland. Her feet at the moment are weak, as you would expect, with under-run heels and poor digital cushions and on her footage she is landing toe first on all four feet. Interestingly she did manage a better landing with one step of her RF - but that's the foot she is lamest on when she is on a circle! Patsy from Nic Barker on Vimeo. A late blog today because Solomon is going home tomorrow and Lucie took him hunting this morning for his last day on Exmoor! He absolutely loved being out with hounds again and behaved beautifully - apart from the odd forgiveable fidget! Luci'es photos are on Facebook here:http://www.facebook.com/album.php?fbid=10150392910450179&id=673035178&aid=613502 - enjoy! Isha has also been enjoying the weather this week - it is so much more effective to swish your tail and bat your eyelashes at the boys when the sun is shining, after all(!). I've been meaning to post some photos of her hooves for a while but last week's mud and wet didn't make for very good conditions for photography, so they were delayed till now. When she arrived here, she had been on a prolonged period of box rest and had a clear toe first landing, as well as being obviously unlevel on her RF. I've posted all her video footage here, for reference. Her landing improved over the next few weeks but the first thing that happened, within a day or so of her arrival - and possibly as a result of the increased circulation following her starting to move around after her box-rest - was that she developed an enormous abscess in her RF. "Developed" is probably the wrong word, as it had obviously been brewing for a very long time - my guess would be weeks and weeks, given the extent of the infection. 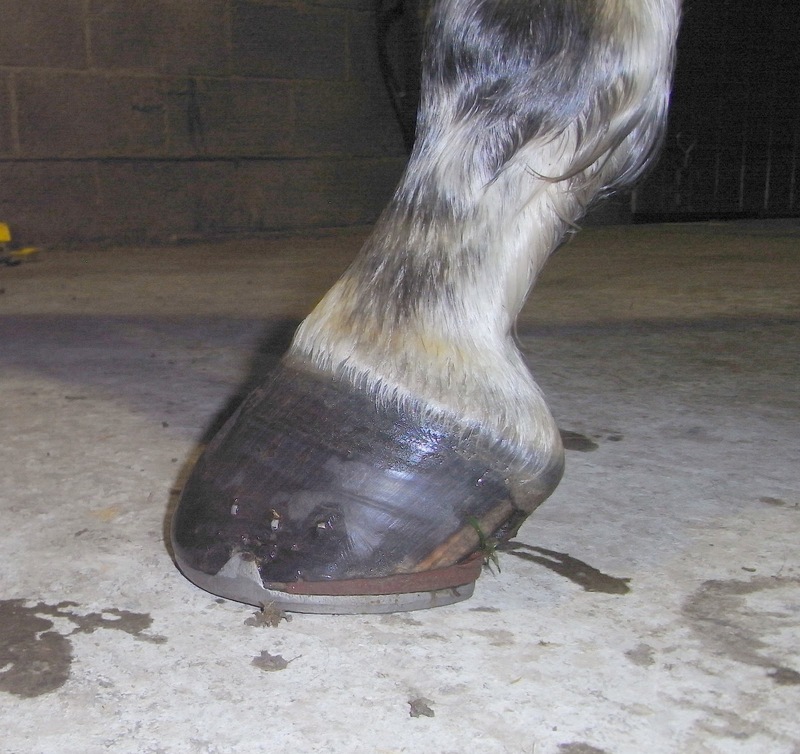 Abscesses are, in my experience, uncommon and certainly don't happen routinely when horses come out of shoes. In fact, I can only remember one other occasion when a rehab horse had an abscess, and that was a tiddler compared with this one. Isha does not do things by halves, though and hers was an absolute stonker - the worst I've seen - and it not only made her very lame for 2 or 3 days but also - as you can see - damaged the whole lateral side of her RF. She is a tough girl, though, and once there was a clear exit hole she recovered rapidly. However, as the damage grew down it became clear that there had been some sub-solar damage as well - those holes under the bars and at the toe aren't normal(!) Fortunately they are old damage and don't cause her discomfort any more but they are evidence of how big an issue the original infection was. By contrast, her LF (above) appears to be a very healthy foot - despite the toe first landing when she arrived - and it shows how good her hooves are likely to be in future. Looking again at the worst foot (LF) - here it is from the lateral angle - the line of the old damage is obvious. 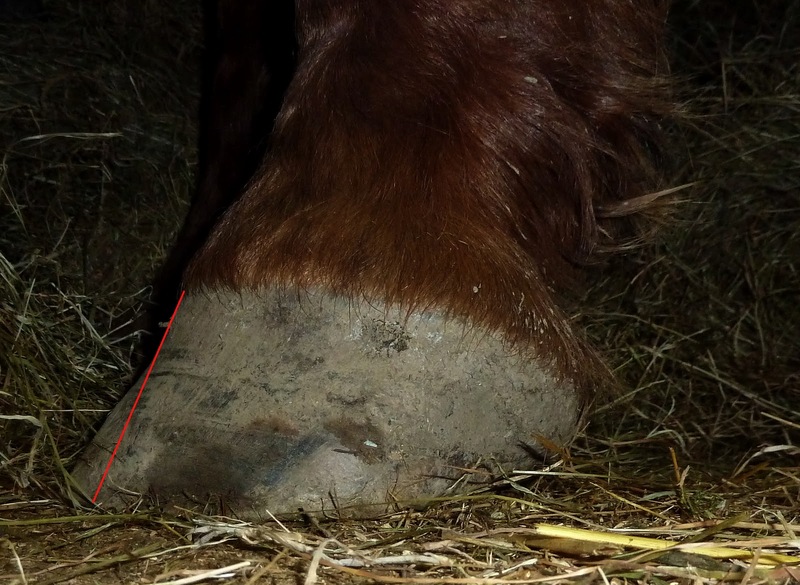 It will take time to grow down, but that hoof is becoming stronger and healthier by the day. Solomon is a proven hunter on his home territory, and he clearly loves hunting and hounds. Twice while he has been at Rockley the foxhounds have finished here and Solomon has leant over the gate chatting to the hunt horses and watching hounds in the barn and yard clearly wishing he could join in. We have the most beautiful weather at the moment and the meet on Monday is local to us so I am hoping and expecting that he and Lucie will have a very happy day. Solomon - 17th December from Nic Barker on Vimeo. Solomon's sunny day from Nic Barker on Vimeo. Following the post I put up on Monday with Kingsley's footage, Wiola posted about it on her blog. She gave me some really helpful comments about him and we talked about what exercises might help to strengthen him. 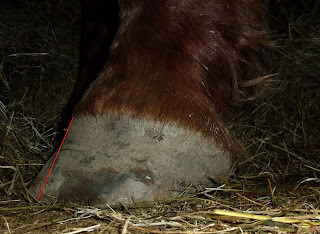 There is nothing wrong with the lines she has put on the hoof, but because they start at the ground, they give a misleading (but fascinating) view of what the hoof is doing. 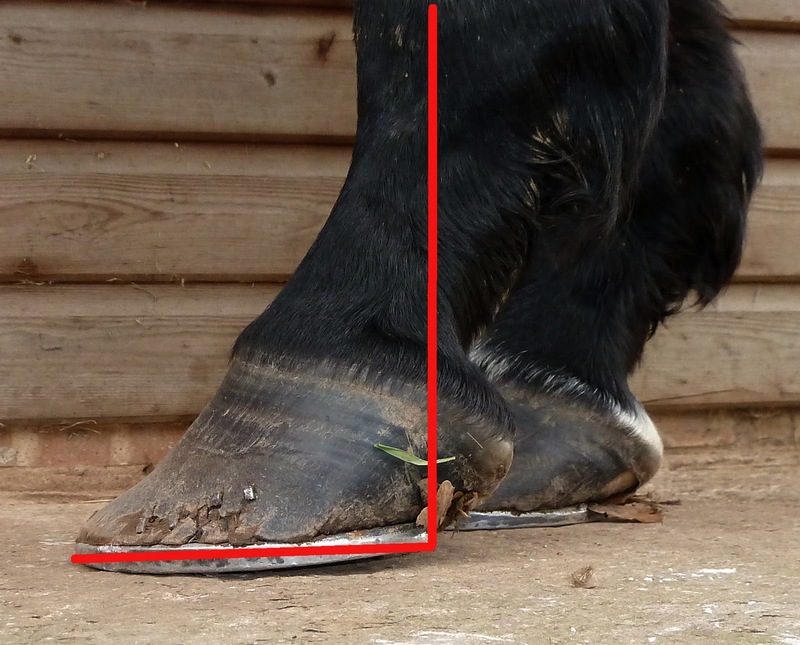 The lines do dramatically demonstrate why Kingsley still doesn't have perfect medio-lateral balance - his hoof is not yet able to support his limb optimally even though he has half a new hoof capsule. 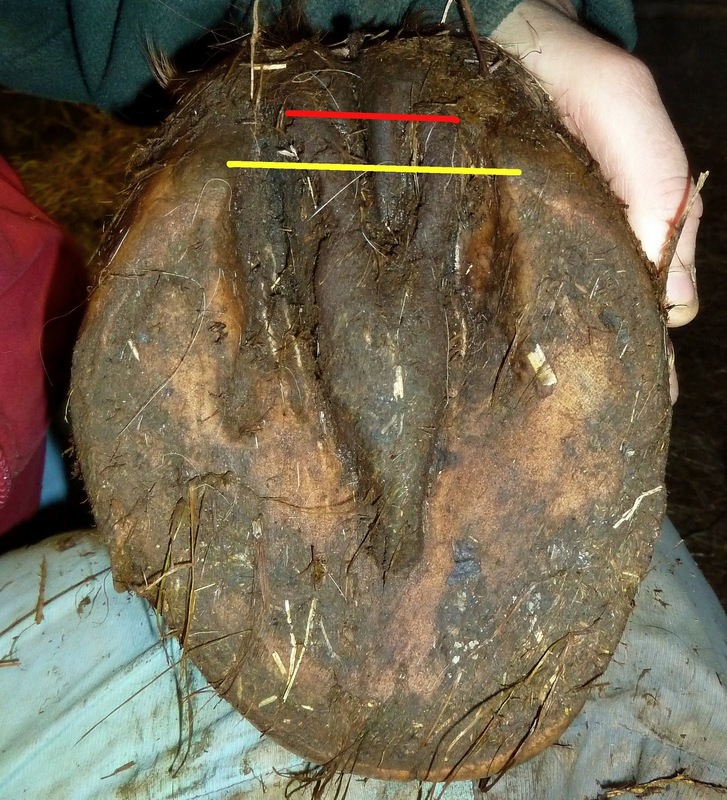 By starting at ground level, however, it means that the lines start with the old hoof growth - which had been causing Kingsley problems in the past. 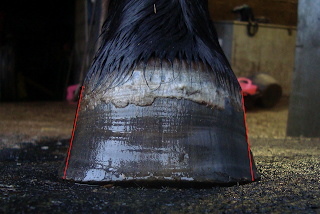 The new, supportive hoof growth starts at the coronet and now extends about halfway down the foot but its at a radically different angle from the old, ground-level hoof. Joining up the newest new growth and the oldest old growth highlights effectively how much change Kingsley is going through. The drawing illustrates what his problem WAS, and why he moved in such a twisted way, but its also deceptive. I hope you can see from this that the new hoof capsule - once it has fully grown in - will actually be much more supportive. The old growth IS still influencing Kingsley, because it is on the ground at the moment and effects his footfall at every step, but it is becoming less influential by the day. 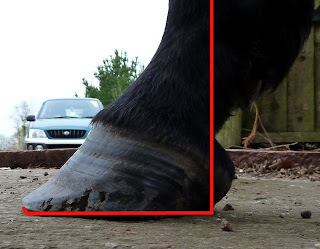 Finally, here is one more shot which illustrates how deceptive hooves can be. As Wiola said, from the top, it looks as if he has uneven wall height and thats what is causing the imbalance. In fact a solar view shows that his wall is smooth and even (there is a tatty bit of frog on the medial heel but that's an irrelevance for these purposes!) - the imbalance is an internal, not an external one and it is that which the new hoof capsule should help to correct. STOP PRESS - Rose update! I've just had a call from Catherine, who owns Rose, the lovely big mare who was with us from August-October. Before she came here, she was assessed as bilaterally 2-3/10 lame on a circle by her vet. She was one of our older horses, at 15, but that didn't stand in the way of her growing a great new set of hooves: http://rockleyfarm.blogspot.com/2010/11/rose-update-photos.html You can also see her video footage in the bar on the right. Since going back home to North Yorkshire Rose has had to contend with some very severe winter weather but she is apparently on top form. I knew she had been going well as Catherine had kindly sent me updates, but the icing on the cake is that she has now been re-assessed by her vet and has been passed completely sound :-) FANTASTIC news - and the vet's comment was that she was not just sound but moving brilliantly! Its very exciting - of course the most important thing is for the horse to be sound and the owner to be happy, but it adds enormously to the credibility of what we do when an objective veterinary assessment backs it up. I added up the mileage the hunters have covered so far this season and to my amazement they have already clocked up over 1600 miles between them! I was surprised because we have lost 6 weeks to bad weather already - which is pretty tough as we still have lots of the winter still ahead of us - and so the horses have not been out as often as they or I would normally have expected. Felix is out in front again, mainly because Richard, who is hunting him this season, is able to get out twice a week, which I often can't manage. Jacko has done very little because after he fell in the bog in September he had to have quite a lot of time off - in fact he only came back into work in December and will only have short days for the next month or so at least, as his fitness builds up again. Angel has done well - although his mileage hasn't been huge he now has a great attitude and absolutely eats up the miles once he is out. I took this photo on Saturday, as we clattered up a particularly treacherous path which consisted entirely of loose rock and granite outcrops - quite nasty especially as it also had a small river running down it after the torrential rain we'd had. Unfortunately the rain also arrived at about the same time as Pauline yesterday when she came to see Kingsley. Fortunately, Pauline comes from Scotland originally and so was dressed for the occasion and not to be put off by a downpour. The fog then rolled in as well so all in all, getting footage for Wiola was going to be extremely problematic. In the end we took Solomon and Kingsley out on a short hack and then came back and filmed once the rain had eased off a bit. We tried to get some comparable footage but it was rather a case of nip and tuck. Kingsley - walking comparison from Nic Barker on Vimeo. This is the walking footage - I've included the earlier dates for comparison, but we didn't manage to film him in walk in the school yesterday, so you have to make allowances for the fact that he is on concrete yesterday and was on sand previously. Kingsley is still at the stage where footing makes a big difference to him - not surprising when you look at the new angle of hoof growth which is coming in. 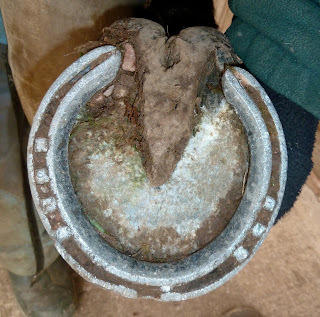 As you can see, he is growing new hoof at a good rate and should have grown a complete new hoof capsule by the time he is 5 or 6 months out of shoes. Meanwhile, the contrast between new and old hoof capsule dramatically illustrates the problems he has had with medio-lateral balance. Until the whole hoof is in the right place under his limb, he won't feel the full benefits of better biomechanics, so its not surprising that at the 3 month stage he doesn't yet have perfect movement. Kingsley - trotting comparison from Nic Barker on Vimeo. I've included the trotwork from 12th December as a comparison. Not a dramatic change but an improvement nonetheless. What would YOU want in a barefoot seminar? Excitingly, Sarah and I have been asked to do a 2 day seminar on barefoot horses in Poland! Its at the end of March and it coincides with another exciting development - a Polish edition of "Feet First" (there is ongoing discussion about what it will be called in Polish which is mostly over my head!). This week I started to put together a skeleton outline of the topics we would cover on the 2 days, and I thought it would be really helpful to get input from you guys about what we should include. Obviously there will be lots of detailed information about the "holy trinity" for performance hooves - nutrition, environment and exercise - and I'd also like to include a session on biomechanics and rehabilitation, as I think its something many people find interesting. Unfortunately I don't think people will be able to bring their own horses but we should be able to include some individual case studies by using video and photos. We will also include some examples of horses who already have high performance hooves and compete or work in different disciplines. PS: Guess what - its still raining...Fog has gone, which is a help, but now we have gale force winds. Oh deep joy. Here on the other hand it has rained all week - apart from Tuesday, when the chiropractor was here - he told me it happens to him all the time in Britain - wherever he goes it stops raining. How I wish he could have stayed here for a month. Sadly he left at about 5pm and by 6pm it was raining. It hasn't stopped. Edward, our friend and neighbour, has a rain gauge and tells me that he has collected 7 inches of rain this month - thats in the last 13 days - and 2 and a half inches in the last 24 hours. The harsh truth is that it rains even more on us than it does on him, a couple of miles away; sometimes it better not to know. Of course, we are very fortunate because we are so high up that it quickly drains away, and when you see footage of places like Queensland and the terrible scenes of people and horses being swept away, our piddling dampness is put into perspective and we realise how lucky we really are. I do find this weather tedious, though, and I am hankering after last month, when the snow was so beautiful and everything was clean, crisp and perfect :-) Thank goodness for modern horse rugs, good wellies and woodburning stoves for when you finally get in at night! Five go mad... from Nic Barker on Vimeo. Last night it was so depressing listening to the wind howling and the rain lashing the windows that I indulged in escapism - I sat in bed watching this, and reminding myself that it won't be winter forever - even though the days of sunshine and unrugged horses seem unimaginably far away at the moment(!) It made me smile, and I hope it does the same for you. Solomon from Nic Barker on Vimeo. With Kingsley, although I have taken lateral footage, its really from in front or behind that you see the biggest improvement in his movement - along with his new found ability to trot on a circle, which is nothing short of fantabulous! I'm including this footage though because it does give a very clear indication of how much more confident he is in his foot and limb placement. Initially, in his wedged shoes, although he is landing heel first he gives the impression of having no clear idea where the ground is. By contrast, in his most recent footage he is jauntily striding along without a care in the world. Its a more subtle change (from this angle) than for Solomon, although he is actually the one whose movement has improved most dramatically. Kingsley from Nic Barker on Vimeo. However, there was just time to get some updated footage of the horses - Ginger and Isha go first today, and I will post Solomon and Kingsley's footage tomorrow. Ginger from Nic Barker on Vimeo. By contrast, Isha when she arrived had strong, correct looking hooves with a robust caudal hoof (you would have said), good heels and a short toe. And yet her landing was diabolical. With her, I wouldn't expect her hooves to change much in appearance, but her landing is transformed. Isha from Nic Barker on Vimeo. It just goes to prove that you can't predict hoof capability just from appearances. Its always interesting to watch the horses interact when they are out on the tracks. It usually takes between 2-3 days to a week to introduce a new horse and with every new addition the herd dynamic shifts, as new alliances are formed and old ones are abandoned or reinforced. Things are more complicated if 2 new horses - who are already a pair - arrive at the same time. Occasionally, horses come here not for rehab but for just a short break, for instance while their owners are away on holiday and this is exactly why our 2 latest guests are here - Harry and Jack. Jack is a miniature version of Andy's Jack - I would guess he is 10hh rather than 16.3hh - so of course I call him Little Jack :-) I think he must have been standing on the bank when I took this, because he is considerably smaller than Solomon as well! Harry is now obsessed with Isha - and vice versa. The horses may be fickle in their friendships but they are never boring! I was right, sort of - the fog didn't last all week, but then there was a rather more significant glitch. As you know, my Dad was knocked down by a car before Christmas and spent a couple of weeks in hospital before coming home just before Christmas Eve. All seemed to be going OK, although he is still in a wheelchair, but then a few days ago Mum was carted off to hospital with what proved to be a massive blood clot. In many ways she has been extraordinarily fortunate, because she has been told that the doctors can't understand why she didn't have a severe stroke. She is still in hospital, remarkably cheerful, and will be until her condition has been stabilised, but you can understand that over the last couple of days there hasn't been much spare capacity for filming(!). ...no, the weather hasn't changed again on Exmoor (though there is another weather warning out for Friday - sigh - !) - these are Sam's snow pics from before Christmas. Best clicked on to be enlarged and enjoyed at a proper size :-) Very beautiful, and I am sure not the last chance this year for snow pics...Thanks as always to Sam for her amazing eye for horses and movement! 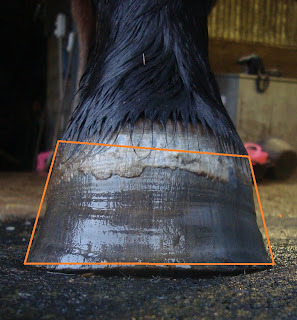 An exciting new development is now going ahead - a joint research project with a group of farriers where we will run a comparison of hoof growth rates, hoof measurements, kinematics and force plate analysis. This has been something I discussed way back in the summer with Mark Caldwell, but its taken a while to get the practicalities sorted out and then the weather has been very much against us over the last 2 months. Now, though, snow permitting, the project should start in the next few weeks and it should be fascinating. We will be using one barefoot and one shod group of horses, all of whom are working hard on Exmoor, and run a 3 month study into how their hooves perform and grow :-) More on that soon! Solomon has now been here 3 months, and he has done incredibly well. From a horse who was assessed by his vet as 5/10 lame on a circle to a horse who could trot fairly competently on the lunge just before Christmas - and he is now even better on a circle. His worst foot was his left front - pictured below - and as well as a weak frog he had a split central sulcus, as you can see. Now, as well as a healthier frog, with a healed central sulcus, he has a shorter toe and stronger heel. Good work, Solomon! I will hope to get some more video footage of him to complete the picture soon!